After my visit to Monument Valley, I headed north from Utah to southwest Colorado. 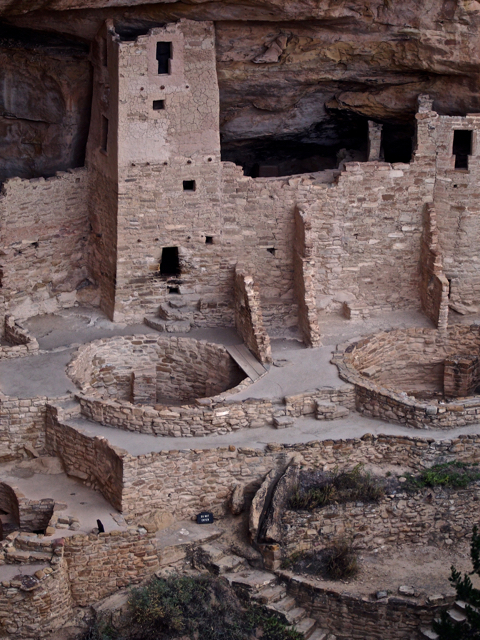 My destination: Mesa Verde National Park. A hundred and fifty miles later, I found a nice quiet RV park to stay in overnight. It was nice to get off the road, relax the evening away and plan my venture into Mesa Verde the next day. At daybreak the next morning I drove into Mesa Verde. A sign told me the site I wanted to see was 21 miles further. Holy Mother of Pearl! But I came this far. What’s another 20 miles or so?! Mesa Verde is famous for its cliff dwellings where Pueblo Indians once lived somewhere between the years 600AD and 1300AD. 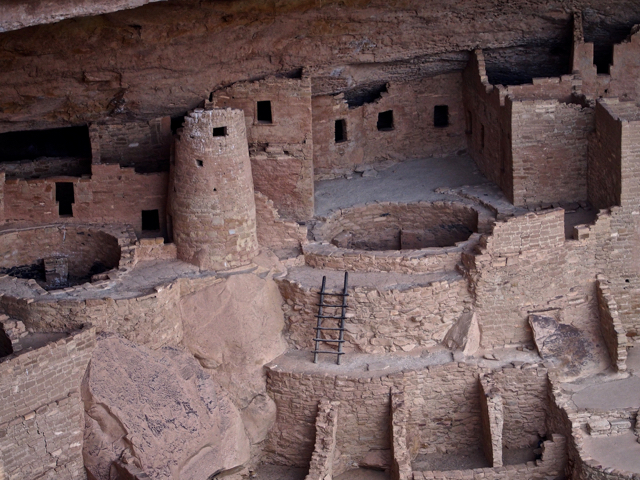 The park has over 5,000 archaeological sites and 6oo cliff dwellings. I was headed for Cliff Palace, the largest and grandest of the cliff dwellings. As I drove the winding road around mountain after mountain, I realized I was going deeper and deeper into backcountry. I was going into what is behind backcountry. And gaining rapidly in elevation. Soaring hawks catching early morning thermals along the mountain ridges were eye-level with me. Since it was late October, this was the off season for the park. I had the road to myself. Reaching the parking lot at the top of a vast mesa, I got out my camera and found the trail. From my car to the overlook was perhaps 300 feet down a winding, paved slope. Easy. And I had it all to myself. Walking back to my car, that earlier “easy 300 feet” was like walking 10 miles on a dry hot day. I actually had to stop to catch my breath and was panting heavily upon reaching my car. I quickly realized that my rapid ascent to 8,500 feet after living for over a year at sea level, was the cause of my discomfort. Drinking some water and resting a bit, I recovered and continued on to photograph more cliff dwellings. ps. In my next post I will share photos of the surrounding countryside. This entry was posted in Uncategorized and tagged NATIONALPARKS, Road Trips, tincantravelerPhotos. Bookmark the permalink. Wow, very interesting. Amazing how they built those on cliffs and with primitive tools. Do you know what was inside of the huge holes? The big round circles? What a place. Good for you. 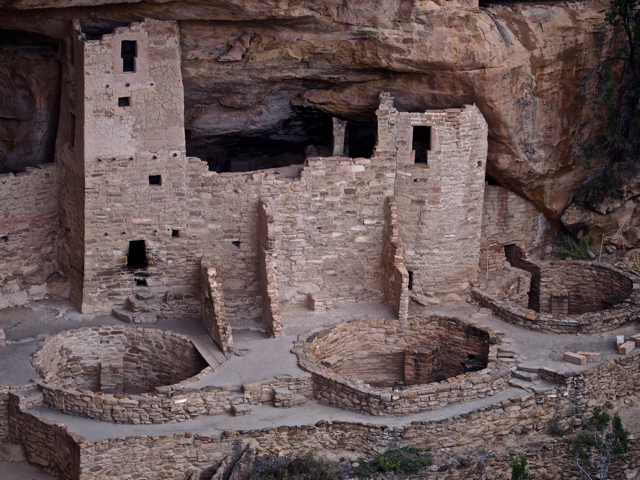 Archaeologists believe that they were community gathering places known as kivas where the Anasazi performed ceremonies, met to discuss tribal matters, and enjoyed each others company. Wonderful adventure. I always enjoy reading and seeing your posts. Ah, so sweet. Thank you so much for your support, Cee. Fascinating stuff. Are you allowed to walk around it or is it look from a distance? You can walk around inside with a Ranger-guided tour. Since I was there in the off-season, the tours were not available. Next time!